Photo provided by Frederik Dawson. Gunung Mulu National Park is renowned for its biodiversity and its karst features that hold some of the largest cave systems in the world. The park lies on the island of Borneo (Sarawak state). Gunung Mulu National Park has the largest known natural chamber or room -Sarawak chamber, found in Gua Nasib Bagus. Over 60 mammalian species occur: they include the common gibbon, maroon leaf monkey, grey-leaf monkey, sunbear , Malayan pangolin, bearded pig, mouse-deer, sambar deer, barking deer, Savi's pygmy shrew and several bats. Also there are over 250 bird species, including all eight of Borneo's hornbill species. Mulu is a very inaccessible area; the only practical way of getting to and from it is by air, mainly from Miri airport. Mulu National Park has to be my favorite park I have stayed in, not only because it offers so much nature, variety of activities, amazing professional staff, but also because the limit of guests that can visit the park makes this a safe and enjoyable experience. Plus if you aren't into homestays or the only official guest house from the park offices (it was fully booked) there is a 5 star Marriott a few minutes drive off that boasts luxury accommodations without breaking the bank. They offered a shuttle to and from the park but you may have to wait a little for it to pick you up. The park offices has a nice cafe with affordable food if you don't want to eat at the Marriott. Getting here is also easier than expected. Coming from Brunei I took the bus to Miri, had lunch, took a taxi (unfortunately costs more than I think it should, and whereas it is a little far I tried to carpool with others and the taxi drivers won't hear any of that), then fly directly to the park. I heard the flights may easily get canceled due to the weather, mainly fog, so I assume some people could have a nightmare experience getting stranded in Miri where there isn't really anything to do. The views from the plane are beautiful. I reached the park in the afternoon and immediately signed up for the night tour. Good idea too because they only do two tours with ~10-15ppl each so it can easily be sold out. Having only so little people on the tour means you can actually see everything the tour points out such as frogs hiding in pipes, snakes not getting immediately scared off, tarantulas stuck on tree branches etc. I have had horrible night tours (e.g. Taman Negara) with literally hundred of people on small boardwalks and only the first few people in the line behind the guide would see understand what is going on and lots of selfish people hogging the front for the entire tour. Plus the jungle at night with nobody around chatting or making otherwise loud noises is an experience of itself. The next day I signed up for 2 cave tours. The first one, the wind cave, was rather mediocre but the guide was really good so even if you see an average cave they really help you understand everything rather than just pointing out the generic "cauliflower" drippings or "a couple hugging" if you imagine really really hard. Afternoon I went to the massive Deer Cave. Now here's a sight. It is apparently a deer cave because before the deer would live in the area and find shelter. It is a massive chamber and it's full of bats, so much that you don't want to look up to the ceiling and say "ohhhhh" else you...you'll figure it out. Reaching the middle point and turning back you get a great view of Abraham Lincoln's profile (see picture). You can also find several naked bats clinging onto light posts for close inspection. At the end of the cave one can see the Garden of Eden, a large sinkhole that looks just beautiful from down here. The name probably does it justice. There are specific tours going into that area should one want to visit but I was fine to believe that the garden is forbidden. At dusk there will be masses of bats flying out from the cave. Make sure your camera is ready. I thought it was mostly amazing to see them fly in those patterns, and as you just sit outside the cave with a great view the pictures ended up coming out well. There was also many information signs outside the entrance that not only explain what bats are (many people still don't know they are mammals but rather rats with wings), their characteristics and the different kind of special in the park. The guides also claim the low, low amount of mosquitoes in the park are due to the bats devouring them. Yes, it's true, I did not even use repellent during my stay, and this is another reason we need to protect bats around the world. I have to add that I went in March and it rained for one night, meaning the last day the hiking trail was flooded and less enjoyable to walk. This was one of those hikes without a guide but off the board walks, but once you reach the swimming areas you get wet jumping into the waterfall pool anyway. I also did not do the multi-day hike the Pinnacle, the razor-sharp karst blades sticking out at the top of the mountain. It's surely a sight but I did not like the itinerary of hiking up during the night and then back to the camp on the same day, camping in the wet forest. I also already filled my share of karst in several places around in the world including Kunming's Shilin Stone Forest. The way the park is run now is commendable. I really love it. One of those places that I would take the effort of going again for sure. There might be no other "mega" caves system in the world that can compare to the grandness and the diversity that Gunung Mulu can offer. Surprisingly, my 3-day visit there turned out to be just too short. I arrived in Mulu through a plane from Kota Kinabalu, passing through Miri. Prior to the visit, I had to arrange everything from accommodation to tours as there are times when everything is just full. I managed to do the walking trails, visit the indigenous Penan settlements, see the four show caves, the canopy walk, the waterfalls, and the tree top tower. The real highlight, of course, are the mega caves. I have to agree to the previous reviews commending - despite the remoteness - the management of the park. Tours are only handled by certified heritage site guides, information posters everywhere, trails are all signposted properly, and the sites are well and strictly kept --- all these efforts are very sensitive to nature. After visiting three natural WH Sites (Kinabalu Park and Puerto Princesa Subterranean River) and several other national parks this year, I probably have to admit that Gunung Mulu is one of the most well-managed sites I've seen. I enjoyed a lot the visits to the Winds Cave and Langs Cave - the two being the smallest of the four show caves) The Winds Cave's King's Chamber will probably hold a special place to my heart indefinitely, together with the small but really highly decorative Langs Cave. Aside from the two personal favorites, the visit to Clearwater Cave and Deer Cave are just as memorable (taking a dip at the clearwater river was probably one of the craziest ideas I've done there as the water was freezing that time!). The other trails I easily did on my own (waterwalls, tree tops, some forest walks, etc.). It was always raining in the afternoon of my visit, and I never got to see the bats leaving the Deer Cave, despite patiently waiting for 3 hours everyday and always getting heavily soaked in the rain. Tours are clear and definite, one set in the morning and another one in the afternoon (Deer and Langs). I, however, felt that the Deer Cave might be more interesting in the morning when the morning lights seep into the interior. Over all, though Gunung Mulu is not as popular as a trip to Kinabalu, it is still quite a rewarding experience. There can only be a few sites as beautiful as this wherein you have to pass by a densely thick forest first. It truly gives one the break that s/he would need from the busy modern life without compromising the quality of the experience. During my visit, I've seen several researchers doing onsite workings - this comes with no surprise as Gunung Mulu is really a paradise for ongoing geological and biological studies. Malaysian Sarawak seemed to be the last frontier of the world with the images of unexplored jungles, unique animals and fascinating tribal cultures, on July 2010, I had a chance to visit Sarawak to find out that my imagination toward this land was not exactly I dreamed but with full of surprise and sometime beyond my expectation. The first view of Sarawak on the plane was endless palm oil plantation, quite amazing sight but truly a tragedy of environment that all lowland jungle had been destroyed. 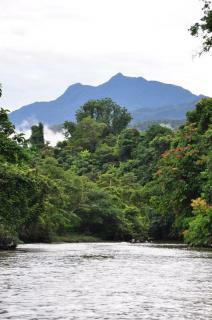 The leftover jungles were on the high mountain and one of the survivors was my destination of this trip, Gunung Mulu. Visiting Gunung Mulu was expensive and bureaucratic over killed from pricy airline and limited park entry permit. Visitors were almost impossible to visit the park without park ranger and had to go in group. 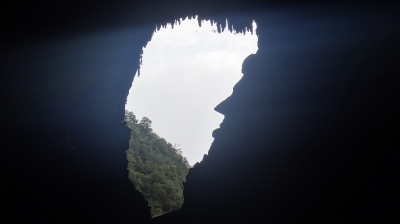 However Gunung Mulu was really a fascinating place with many incredible things to see. The star of Gunung Mulu was the four show caves, Wind Cave, Clearwater Cave, Lang Cave and Deer Cave. These four caves were different and had their own characteristic. Wind Cave was full of beautiful stalactites and stalagmite especially in the King Chamber. Clearwater was jaw dropping with huge underground river caverns, one of the longest cave in the world beautiful pond in front of the cave and uniquely one leaf plant that only found in Gunung Mulu. Lang Cave was the smallest but with many fantasy stalactites. The last and my favorite was Deer Cave with its gigantic cave entrance was so incredible and full of mystery feelings, Lord of the Ring's Moria cave in the real world, and in my opinion one the best thrilled I had encountered in recent year! Not only was the cave, the jungle also amazing with many insects and trees that in my life never ever expected to see. The only down point was the much advertised bat exodus, Gunung Mulu had one of the biggest bat colony in the world, but its bat exodus was quite mediocre than I expected. Also one of my favorite surprises was the sign of this national park which made from glass, located in the lush tropical jungle, but the sign was really always shining and clean! Another surprise was the Royal Mulu Resort, a nice hotel with full of UNESCO WHS symbol, and well recommended. In just 2 months I had opportunity to see two important karstic regions of Asia, Gunung Mulu and South China Karst. I was quite surprised to see many reports compared these two sites especially Pinnacle Rock of Gunung Mulu and Shilin, Stone Forest of China. After long climbed, Pinnacle Rock was quite disappointing since it could not be compared with the enormous size of Shilin. However both Gunumg Mulu and Shilin were equally fascinating on their own. Although seeing many karsts in just a short time, boredom had not overcome and really made me want to see them more. The most efficient way to visit Gunung Mulu is to fly in for an over night stay from Kota Kinabalu. They have daily flights into Mulu via Miri and the plane lands at about 3.30pm. You can do the Deer Cave right away and watch the bats come out in the evening. It will take an hour walking through the forest on raised plank walks. The Clearwater cave can be visited the next morning via a 30min boat ride on the Melinau River. This is really pleasant and peaceful ride. After lunch, there is a flight back to Kota Kinabalu at about 2pm. Well worth the effort but bring rain coats. Within the boundaries of Gunung Mulu National Park in Sarawak is one of the most extensive and spectacular limestone cave systems on earth, as well as the second highest mountain peak in the state. Gunung also enjoys unusually high rainfall. As a result it bursts with life, and many new plant and animal species have been discovered here. Officially constituted in 1974 and opened to the public in 1985, Gunung Mulu National Park encompasses only 544 sq. km in North Sarawak, Borneo. Gunung Mulu's Caves are extraordinary. Mulu's Sarawak Chamber is the largest natural chamber in the world, and Deer Cave is the largest cave passage known to man. It has two huge entrances at either end of the mountain it penetrates. Most of Deer Cave is illuminated, one can see 600-foot waterfalls pouring from the roof following a rain storm. Perhaps the most popular attraction of this cavern, however, is the daily exodus of its colony of nearly a million bats. Every evening the bats stream from the cave to spend the night dining on Gunung's rich insect population. Clearwater Cave is the longest cave system in Southeast Asia. Although little of it is open to park visitors without special permission, over a hundred kilometers of passages have been discovered so far. Not all of Mulu's limestone features are contained in caves. Gunung API, a 1,750 meter high mountain of limestone, lies directly beside Sarawak's second highest mountain peak, Gunung Mulu (2,376 meters). Both mountains are over five million years old. About two-thirds of the way up Gunung API sits a mass of enormous razor-sharp limestone pinnacles, the result of the steadily heavy rainfall experienced in this area over the last, oh, couple of million years or so. 60 Community Members have visited.